Recently there has been discussion in the media, on twitter and on various blogs about how books written by women are represented with respect to published reviews and the #readwomen2014 campaign launched as a result. The annual survey carried out by VIDA – The Count continues to show them as being under represented in most of the major publications that provide reviews and in translated fiction. It made me wonder what I do read. I don’t think I have a bias towards male or female authors, but I do have a preference for cross-cultural fiction and I like to read translations, so I decided to look back over the last year and see how I fared. 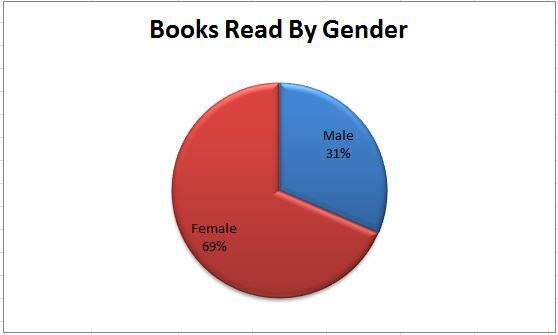 As you can see below, I definitely read more female than male authors and slightly more than 2012 when 62% of the books I read were by women. In total, during 2013 I read 70 books, slightly more than the one book a week I have as an intention and 10 books more than I read in 2012. As those who read this blog may know, I like to read cross-cultural, contemporary literature, so I read more modern than classics and I like to read around the world. What I hadn’t realised was that last year I read books by authors from 22 countries! Check out this fabulous pie chart. 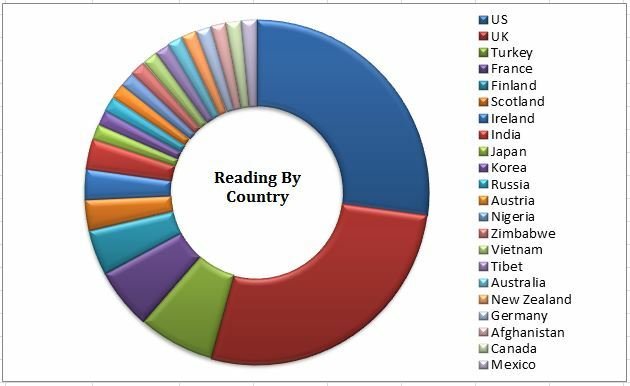 Compared to 2012 when I only read books from 17 countries! From the US and the UK, I read exactly the same number of books (19) and a visit to Istanbul in May prompted an increase in Turkish literature (5) and three books in December helped my French literature (4) to increase, but I hope that will improve in 2014. 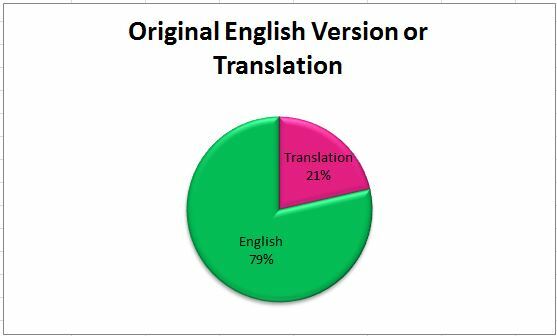 To read that widely, it is necessary to read translated work and 15 of the books I read or 21% were translated compared to only 10% in 2012. I’ve certainly travelled the world through books, I may have to start checking the globe to see which continents are missing. And what kind of books do I read? 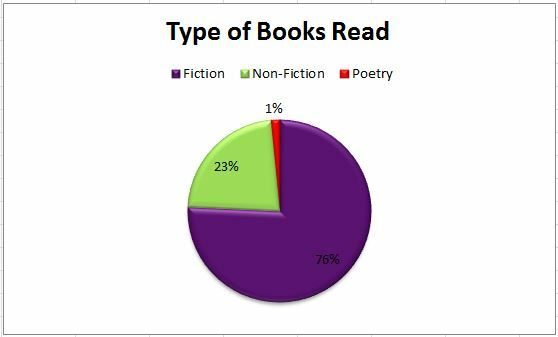 Well mostly fiction, a hefty 76% compared to 23% non-fiction and only 1% poetry, but less than 2012 when 82% of my reading was fiction and 16% non-fiction. I did read some excellent non-fiction in 2013 and hope to do the same this year. And lastly, how do I read? Yes, I have a kindle and in 2012 I read 25 books or 41% of them electronically. In 2013 that has increased to 46%, that’s 32 books on the kindle, almost half my reading! That’s thanks mostly to NetGalley who send me ARC’s (Advance Reader Copies) from the publishers that I request, which I am immensely grateful for. So now I know what I read and I think I shall just keep on doing the same, which is to be as spontaneous as possible, to engage with others who read for recommendations and keep reading around the world! This entry was posted in Fiction, Non-Fiction, Poetry and tagged books, classic, culture, fiction, literature, nonfiction, poetry, reading, translated fiction, world literature. Bookmark the permalink. So interesting! I think you should make the reading graphs into an app. I will buy one! This is fascinating, Claire. You do have an exceptionally well-travelled mind. Yes, it kind of shows doesn’t it? There was a decade when that graph would represented the countries I had travelled to, now however I mostly continue through books! Yes, I did them myself, I used to be an excel whizkid back in my market research days, but never made anything as interesting as this! 🙂 And thanks to my 12 year old I know how to use the snipping tools as cut and paste from excel into wordpress wasn’t quite as easy! I love book stats! It’s nice to look back to get an overview of what you’ve been reading. I did poorly on the female:male ratio last year so hoping to improve that. And also planning to read more non-fiction as just 5 of the 53 books I read last year were NF. Thank you Didi and likewise, yours is one of my favourite places to come for recommendations and I find your Youtube channel booktubers quite addictive to listen to! The three pics at the end are very typical of how I manages to squeeze in time to write reviews, this is Cucurn, a small village in the Luberon, an area where I have a few aromatherapy clients, so when I have 30 minutes or an hour between rdv’s, I sit here and write my reviews into my notebook, to be transferred onto the computer later. I love the piecharts Claire!-flashback to my school days. What a great idea. I’d love to do that with what I’ve read and see how they come out. It wasn’t too difficult with an excel spreadsheet and a fun and interesting exercise to do for the book obsessed! Cool. And fascinating. I’ve never analysed my reading year… must do it. Apropos women and reviews, it was interesting late last year to hear Eleanor Catton comment that she had been essentially bullied by male reviewers. My take is that it was probably symptomatic of NZ’s territorial literary culture rather than specifically genre based. But an interesting observation nonetheless. Yes, I remember reading about that in a few interviews and articles, I think there is negative criticism and constructive criticism and for those who don’t like or appreciate a work of literature, more effort needs to be made to articulate those views with intelligence and respect. It may not be about gender, but when that is the common denominator among those all taking a similar view, it is indeed how it will be perceived by many. 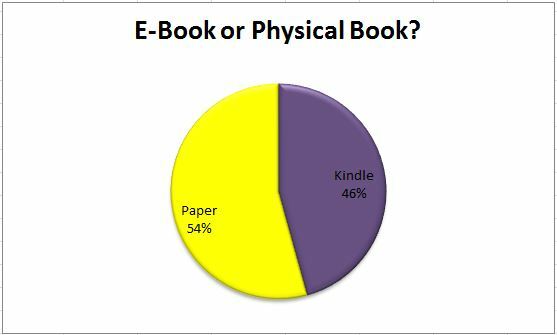 Fascinating stats, I do love numbers…it is wonderful to see paper winning the battle with the kindle…I am a partisan traditionalist. After reading this it may be time to mend my haphazard choosing system. Haphazard is good, but it’s interesting to look back and see if there are indeed any patterns or inclinations. I love reading real, paper books too, but the kindle is great for accessing new releases which I would otherwise have to wait a very long time to read. Very impressive graphics . . . And those who follow your blog are all the richer for the wide range of books you choose to review. I think what Vida does is important, as is the #readwomen2014 campaign. Thank you Deborah, it’s thanks to you all that I discover these gems and yes VIDA, this campaign and many others who focus on women writers are going to make a huge difference in the coming years I am sure. Well, so far I’ve been reading only female authors this year – and I didn’t even know I was trendy…! Well, I can’t do the clever pie-charts, and my maths is clearly wonky as it all comes to 101%. However, it was instructive. I was truly shocked to see that 59% of my 76 books were by male authors and only 41% female. I’d really thought it was 50-50. Only 7% works in translation, so lots to do there (though in my defence, a far larger percentage were by non UK writers), and only 18% non fiction. I didn’t count poetry, as I usually dip into it, and dip out again, so rarely list it. I’ve learnt from this though. There’s nothing wrong with picking up what you fancy, but sometimes it pays to be a bit more self-directive to become a more well-rounded reader. It’s a bit late for New Year resolutions, but I might just be formulating one here. Thank you. Brilliant, I totally agree that while spontaneity and freedom to choose are great guides, these tools to greater reading-awareness can help us make subtle shifts. I actually thought I may have read more male authors than I did, and I am certain that it is from reading blogs that my own awareness of more women’s literature has increased and last year I made an effort to read more non-fiction and nature writing which shows. Just thinking about these things helps a shift to occur. Thanks for sharing Margaret and Happy Reading! That’s my goal too, a book a week or 50 pages a day. As long as I read a little every day, it’s achievable and there’s nothing like tracking it to help achieve it. Go on, check out the gender, it’s better to know than to suspect, I was surprised myself when I checked. This was the first time I’ve ever done so Geoff and you’re exactly right, thanks to the blog, it’s possible to look back, wow, 3 years, that’s going to be really interesting. I hope you do analyse it and let us know. Why thank you for all those compliments and actually I almost wanted to say more about the Scotland entries, because of course that doesn’t tell us that one of those Scottish writers while born in Glasgow, grew up in Sierra Leone, how I wished I could have added that to the list too. Just fascinating, Claire! I might have a go at this. One thing I thought of, because I categorize my books this way on Goodreads, is the setting of the book-which would capture Aminatta Forna’s Sierra Leone-theme/setting, or Anthony Marra’s Chechnya. It struck me during my time in New Zealand how many different authors I was exposed to, albeit European or from the Antipodes, who still have little to no presence in the U.S. I can see from following your reviews how many authors you read that I, who considers herself pretty well-read, don’t encounter here. There’s such a world to discover! Isn’t it fascinating Julie, and yes, I agree Aminatta Forna’s work is influenced far more by the land of her upbringing, Sierra Leone, and even her subsequent work, The Hired Man, set in the former Yugoslavia takes us to a place and time not represented by the place she happened to be born, her interests influenced by her experiences in those formative years. I too found that is not until I travelled elsewhere that I discovered how much more there is on offer to read and that schools, universities and bookshops often have patriotic inclinations. Here is where we can discover the world, no longer limited to just a few perspectives, those outlets now sit as one option among the many. Great visual breakdown of your reading, Claire – may have to copy your pie-charts, as they are so much more eloquent than words alone. I love the 22 countries you ‘visited’ through your reading – who’d have thought Turkey would be in third place? Well done. Look forward to seeing what 2014 will bring. Yes, nothing like a visit to another country to inspire one’s reading! Not planning any exotic travels this year, so may have to bump up the French literature contribution and with it being #TOVE100 the 100th anniversary of Tove Jansson, in 2014 I imagine Finland may feature up there this year. I hope you too start making pies of reading! Claire, this is such a fabulous post. I’m inspired to do the same analysis of own reading but I know I’m not as varied or diverse a reader as you. I had noticed I tended to read female fictions writers so I consciously made an effort to choose male fiction writers more often, and I’m never sorry when I do. (I think I read more male than female nonfiction writers – is that because there are fewer female nonfiction writers, or am I unconsciously biased in some way – because I really do love good nonfiction.) You’ve also highlighted to me that I really want to do more cross cultural reading. And your blog is an excellent place to find suggestions. Fascinating to see your reading habits, Claire! I did a similar analysis, although not so detailed, on my blog recently. My male/female ratio was about half and half, and I didn’t read as much foreign fiction as I’d have liked. It was my first year keeping track of my reading in such detail, and I found it really illuminating. Thanks for sharing your stats! Thank for the return visit and comment, it seems like with reading there is an equivalent experience to leaving home, I used to think that by visiting many different bookstores I was experiencing variation and then I moved countries and met fellow avid readers but from the US and found myself continuously saying, No I haven’t read that, no I haven’t heard of that author, realising to my amaze that my reading was very influenced by English publishing so began to remedy that; and then I started blogging and suddenly discovered I could chat with an even wider audience than those close to me or visiting the same bookstore and found that I am really attracted to much that isn’t available in all those places I spent years frequenting. 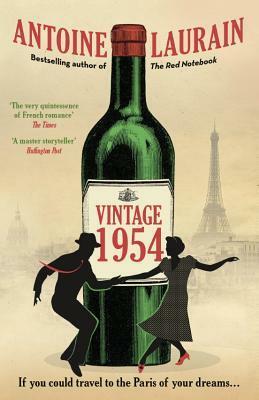 I firmly believe there is a greater demand for translated works than is currently on offer, I mean how can British readers be so different from the French, who have on offer 45% of fiction in translated form. It is so common here, they don’t even realise they are reading it, they judge a book on its merit, not on its origin and they have to be big prize winning works that can in fact alienate the common reader. I enjoyed reading your reviews of Russian literature, I want to read more of it and not just the well-known classics, I’m interested in their equivalents of the kind of works I enjoy, but it will be that much harder to find them, like another world I’m just opening the door to, but I have found a few bloggers who read in Russian and English, such a joy to be able to connect with them. Happy you enjoyed my enlightening charts, I was quite surprised myself by the results even if they do reflect my intentions, it always seems that the books I am looking for are being drowned out by the voices of the biggest and most prolific. Majority USA & UK. Exactly why I decided to do my own challenge “May 2014 without USA and UK” culture. Since you love languages, and reading cross-cultural, why there is no book in original language? You can’t really get the whole cross-cultural picture without reading in the original language. 21% of translated books isn’t impressive either. This is what I read without challenging myself to read anything in particular, it shows that in order to read diversely we have to have more of an intention to do so, as you suggest with your challenge. I do love language, but I don’t speak or read any other language than English and French. It’s not my desire to learn to read in other languages, but I wouldn’t like to not read books just because they happen to be translated and not read in the original language. I love watching films in the original language with subtitles, beacuase you are right the original language really adds something. But equally I think it is important to support translated works, for the very many people who can read or speak no other language than English at all. I’m not trying to impress anyone, I’m merely asking a question, What Do We Read? Thank you for taking the time to comment. Happy Reading. Hope you are having fun reading some beautiful books this year. I can’t believe that one-third of the year is really gone – time flies! Happy reading! If I had your reading breakdown I would keep on doing the same too! A very nice breakdown. Thanks for linking me to it.